to the lead boats; if it doesn�t, you will lose boats and distance while doing a 720.
you need and how much risk (loss) you are willing to accept. In the second race of a regional championship, Joe Cool was sailing up the first beat in 15 knots of wind. 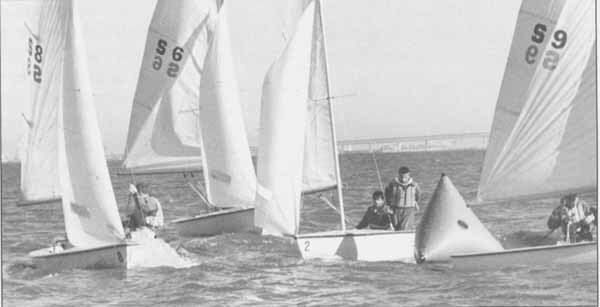 He had been fourth in the last race, and all he had to do was finish in the top five of this seven-race regatta to achieve his goal, which was qualifying for the Nationals. Joe started at the committee boat end in this second race, but got squeezed off and ended up playing the left side of the first leg pretty hard. Luckily, the wind shifted left during the leg, which put Joe near the front of the fleet. However, all the other 40 boats were to his right. As Joe approached the mark on port tack, he converged with a line-up of starboard tackers. At first, it looked like he could cross the lead boat (and the rest). That was good because it would put him in second place. He didn�t want to duck below the first boat because he would have had to go behind about six others, too. And he didn�t want to tack to starboard because he was already near the port-tack layline. So Mr. Cool decided to go for the cross. Unfortunately, the other boat was a little closer than he had thought, and she claimed she had to bear off slightly to avoid contact. Joe didn�t believe this, so after a bit of debate amongst his crew, he continued racing and finished third. That finish really put him in good shape, but the boat he crossed filed a protest. Bad luck again. The jury agreed with the other boat and disqualified Joe from the race. Joe had to use this race as his discard, and his chances of getting to the Nationals had just gone from great to marginal. What went wrong? Joe�s problem on the first beat was a common mistake that sailors make�ill-advised risk-taking. A risk is a chance you take on the race course. Sometimes, taking a risk will result in a gain, or reward. More often, a risky move will cause you to lose distance, get passed by other boats, or both. By itself, risk is neither good nor bad. It depends on your situation in a race or series and your assessment of the probable success of that risk. However, a lot of risks are not worth taking. Many times you don�t want to risk losing anything, or at least the reward you might get is not worth the risk you�d have to take. This is typically the case near the beginning of a race or series and when you are doing well. To be successful in sailing, you must perform consistently well for entire races and, then, for long series. In a sport like tennis or basketball, the down-side of taking a risk is that you�ll lose a point. In sailing, a bad risk can put you so far behind you�ll never catch up. RISK - a chance; the possibility of losing distance and/or boats; an action associated with a low or unknown probability of success. REWARD - a gain; the good result of an action; an improvement in your position in terms of boats or distance or both. There are two questions you need to answer on a continual basis while you are racing. First of all, how much risk are you willing to take and how much reward do you need? This depends on a number of variables including your position in the race or series, and how much time is left in the race or series. For example, if you�re not happy with your position, you�d probably be willing to take a large risk in order to get a big reward. The second thing you must do is evaluate how much risk and reward are involved with any decision you make. For example, in a windy race you�re thinking about doing a jibe set at the windward mark. How much will you gain by this, and how much are you risking, based on your crew�s experience, the positions of other boats and so on. Once you know how much risk you�re willing to take and how much risk is is involved in any decision you might make, all you have to do is make the choices that match your risk and reward levels. Of course, it�s easier to do this in theory than in the midst of a race, but you should aim for this kind of thinking. One of the biggest risk factors in any race is your position on the4 course relative to other boats. 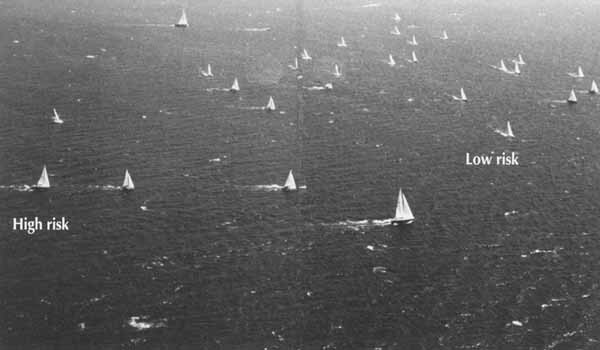 In general, the more separation you have from other boats, the more you stand to gain or lose due to changes in wind direction or velocity. Separation is good when you have little to lose and you need to make gains (e.g. it�s late in the race or series and you�re not doing very well). However, more often than not you should minimize separation (and risk) by staying near the middle of the beats and runs, between other boats and the next mark. With this in mind, let�s go back to the story of Joe Cool�s second race and examine his decisions from a risk and reward perspective. One of the things Joe should have thought about before he started that race was how much risk he was willing to assume and how well he needed to do. Here are some of the factors he should have considered: It was only the second race of a seven-race series. Joe�s goal was to finish in the top five and qualify for the Nationals. In the first race, Joe got a respectable fourth, which showed that he was very competitive in this fleet. The start - Joe started right at the committee boat end, which was a high-risk move not compatible with Joe�s overall risk tolerance. Joe didn�t need to win the start; he would have been much better off with a more conservative start away from either end. First beat strategy - Joe went all the way left until he was the farthest boat to that side. This was another high-risk move that was unnecessary. If the wind hadn�t gone left, Joe would have been near the back of the fleet. It would have been much smarter to stay closer to the middle and try to round the mark in the top ten�then work his way up during the rest of the race. The crossing situation - As Joe got near the windward mark, he had to decide whether or not to try crossing a starboard tacker. The reward for success was second place; the risk for failure was having to do a 720 and falling back to 10th. Would you have tried this? I think I would have played it safe by doing a lee-bow tack, and hopefully forcing the other boat to tack before I reached the port-tack layline. � It�s late in the race or series. A 720 or not? - Failing to do a 720� penalty was probably Joe�s biggest risk (mistake) of all. Just after the crossing he was in second place and being protested. If he had done a 720 he would have lost about eight boats, but he still would have rounded the mark near tenth place. If he didn�t do a 720, he was taking a large risk of being DSQ�d, which is what happened. Since it was only the first leg of the second race, and Joe needed to finish only fifth in the series, this was a risk he should not have taken. The moral from this story is that, when it comes to risk and reward, you have to think ahead and keep the big picture in mind. Figure out how much risk you�re willing to take and/or how much reward you need to get. Then make race-course choices that are consistent with these levels. Whenever you must make a choice or a decision on the race course, you have to think ahead about the risks involved and how much risk you are willing to assume. Even a simple port-starboard convergence can involve a wide range of possible risks, both tactically and strategically. For example, if you are the port tacker (P) and you get too close to the starboard tacker (S), you risk a foul and having to do a 720. this may be a chance worth taking near the end of a race when the boats are all spread out, but it could be very expensive at other times like the first beat. When you converge with another boat, you must also plan ahead about which way you want to go based on wind, course geometry and the position of other boats. Think about how much risk is involved in various strategies, and try not to let the other boat push you in the higher risk direction. If you make decisions at the last moment or with your head in the boat, you are bound to take too many unnecessary risks. And that is not a good way to get consistent results or achieve your goals.